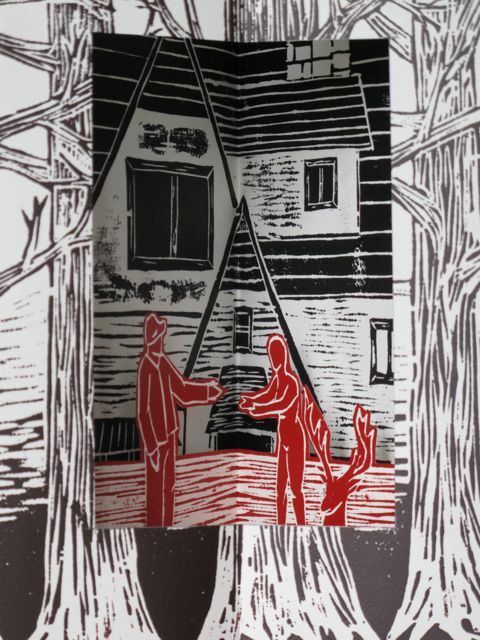 I got this beautiful woodcut pop-up book made by Alison Yates at Pretty Penny’s craft exposition this weekend. 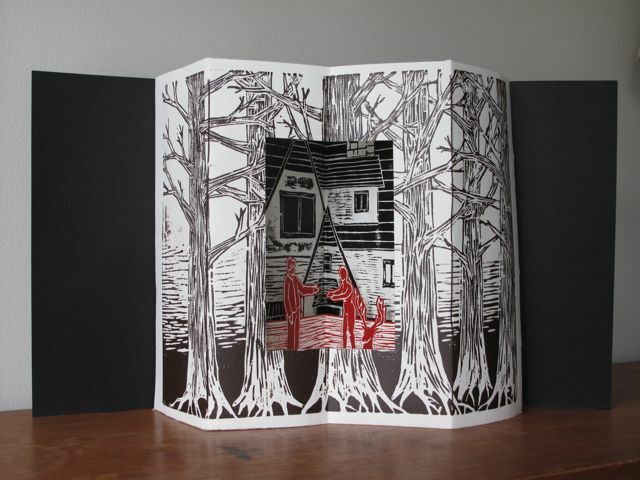 This combined with a recent trip to Addison Endpapers is really tempting me to start making books. There are just too many good things going on these days. Pretty Penny, recent winner of not one, but three East Bay Express Best of the Bay 2009 Reader’s Poll Awards (Best Vintage Clothing, Best Women’s Clothing, and Best New Business) (and my favorite vintage shop to boot) will be hosting a craft fair all day this Saturday featuring Oakland and San Francisco’s finest artisans. Come enjoy beverages and hors d’oeuvres gratis while browsing their wares–plus the hottest vintage styles around. Open Opera is a new organization with a mission–to bring more opera to the world to new and wider audiences (starting with the Bay Area)–and all for free. In order to do this Open Opera’s performances are staged in our beautiful public parks. 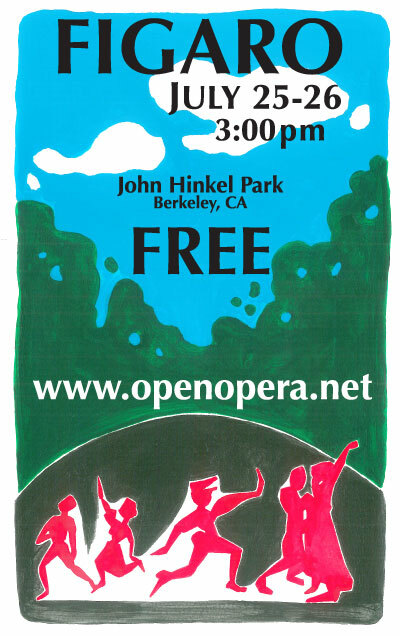 This Saturday and Sunday Open Opera will be performing the Marriage of Figaro at John Hinkel park in North Berkeley. Peko Peko will be on hand in case sopranos make you hungry. Sylvan Mishima Brackett says, “Intermit with our summer katsu-sando bento, American-size king salmon onigiri, luxury melon drink, and strawberry ice cream sandwiches!” You know I will Sylvan, you know I will. I report with a heavy heart that I returned to Rockridge to learn that we are losing one of our inveterate retailers, August. I could always rely on August to bring me a tiny bit of Brooklyn via Refinery29-style faves like Vena Cava and Loomstate, but no longer. Thankfully their Mill Valley location will stay open, but their loss will be felt in Rockridge. 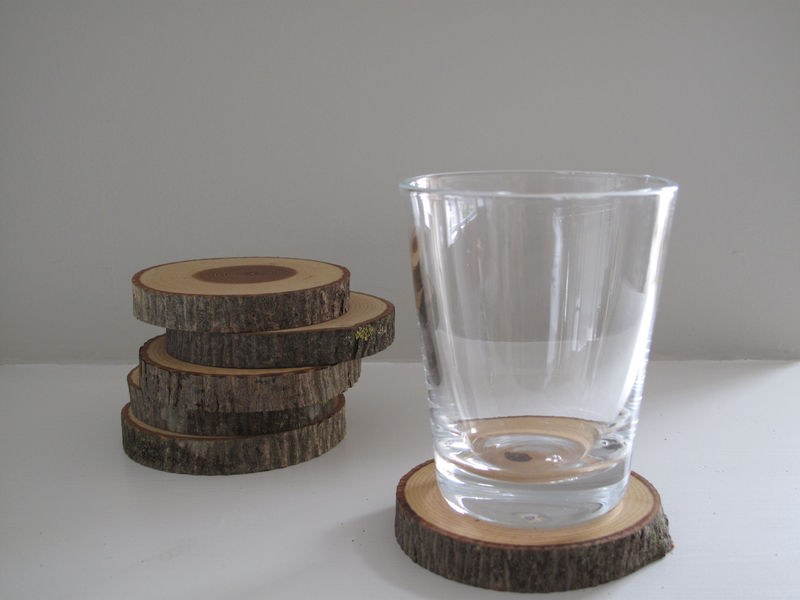 Stop by to say goodbye and pick up some of their gorgeous wares at painfully low prices. 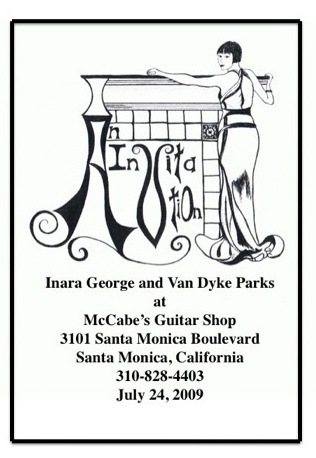 On her most recent solo album Inara George (the multi-talented member of various and diverse acts such as the Bird and the Bee and the Living Sisters) collaborated with longtime friend Van Dyke Parks, famed composer, songwriter, lyricist, arranger, and producer. The results are intoxicating. The New York Times says “Ms. George muses on love, yearning and separation in lyrics that can be ingenuous or surreal…meanwhile Mr. Parks surrounds her ballads and waltzes with a nonstop counterpoint of melodies and of allusions…” And to see these two characters on a stage together (and one as intimate as McCabes at that) is a real treat. Oliveto Community Journal reports via their Twitter: “Rumor has it Catalan Farms has the first EXCELLENT slicer tomatoes of the season! @ [Berkeley Farmer’s Market Thursday and Saturday].” Tomato season is on the verge of beginning in earnest. See more on Catalan Farms here. Commis Restaurant opened while I was away and I can’t wait to try it…if anyone has any early reviews let me know. Mandela Food Cooperative’s opening this past weekend. West Oakland has not had a full service grocer in three years. It’s unconscionable. The worker-owned MFC is working to set this wrong right by supplying locals with food from farms no more than 170 miles away from Oakland and offering nutritional education workshops. In addition, the cooperative will soon make grocery pick up available directly from West Oakland BART. More from the Oakland Tribune here. Congratulations to everyone who worked hard to make this happen! The Au Revoir Simone show this Saturday, June 13th at Bimbo’s in San Francisco. 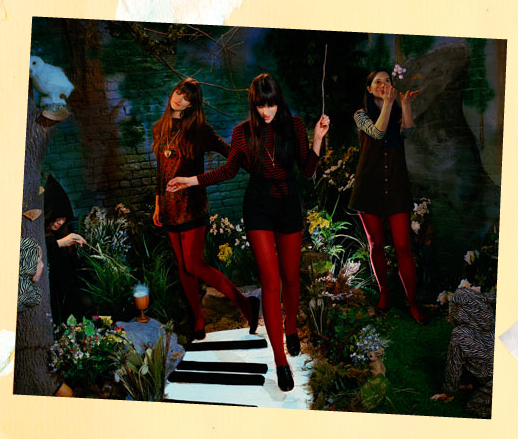 You should visit their website to see some amazing collages and listen to lightly twinkeling bells and organ behind their smooth vocals (song: “The Lucky One”). At $16 the show is a steal. Why don’t you join me? 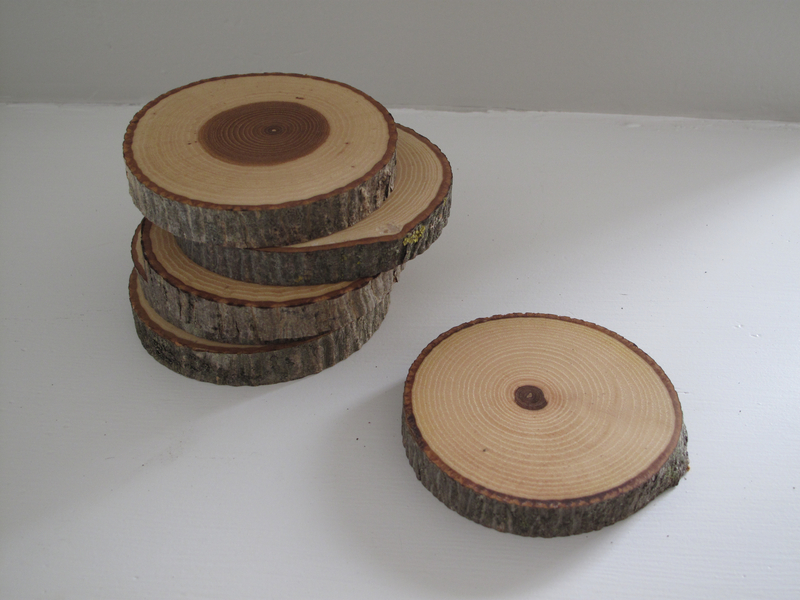 Heronswood, a new nursery discovery for special perrenials. Heronswood has tons of hellebores (my favorite flower) in every color imaginable. In spite of the fact I just planted seven new hellebores ranging from green to dark purple/black, I still want more. I’m considering the “Ivory Prince” in particular. 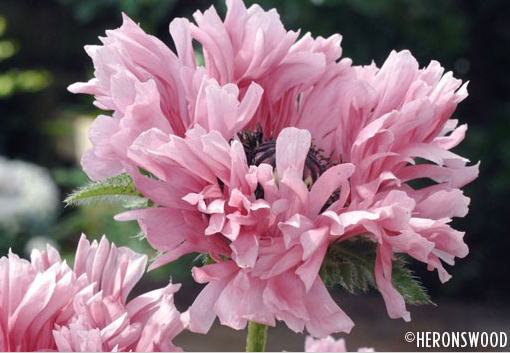 And how about this oriental poppy called “Ruffled Patty?” How wild is she? Then I took a little detour to hit August-they are having a huge sale. Super premium denim from Habitual, Loomstate, and everyone’s favorite, Acne, is marked down-down-down! The Acne dark rinses they have at around $100 are especially enticing—get over there! They have tons of sizes too. Very exciting if you’re like me and you’re loath to pay full price, but would love something a little more special than the 3rd-hand Levi’s you usually wear every once in a while. 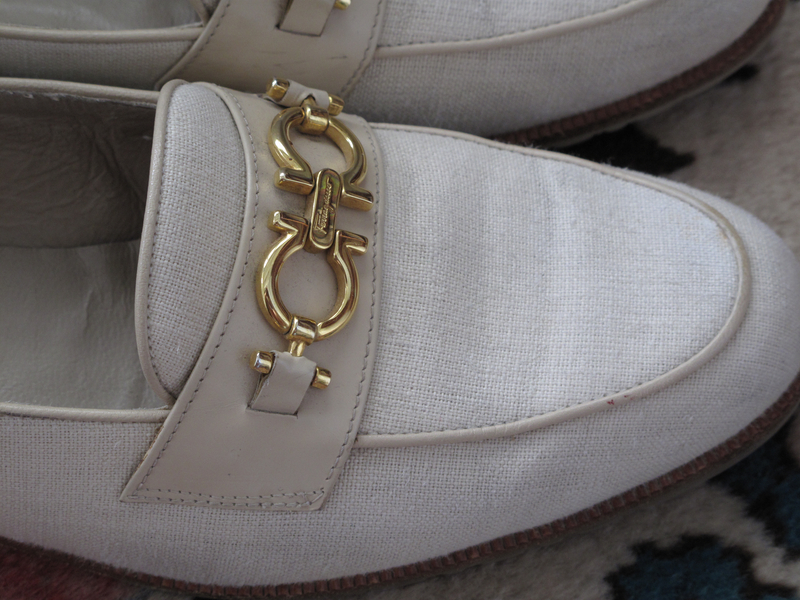 Can you tell I have a white loafer obsession or what? Guess how much? Just guess. $26. !!! 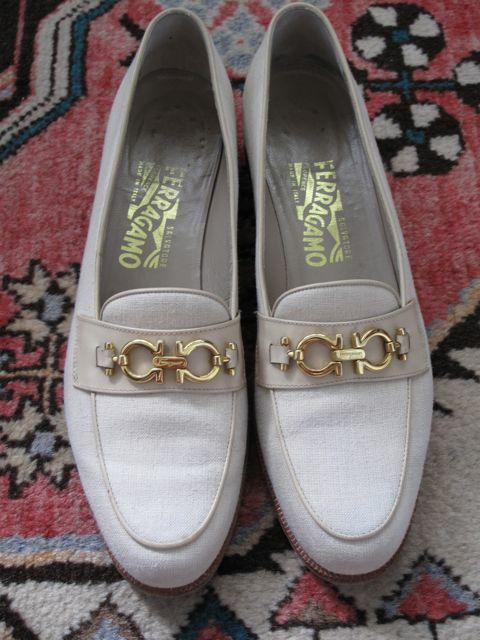 I love Ferragamo and I love Pretty Penny. Small businesses, especially retail establishments, are closing one after another. Unlike some places (perhaps New York City) small retail business closings do not beget new, hipper small retail business openings. Instead, we get Jamba Juice and Pasta Pomodoro. 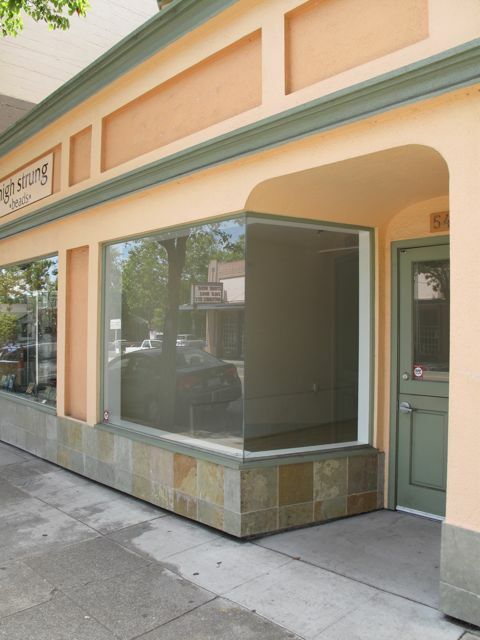 Residents of Rockridge have the income to afford small boutique shopping. If you’re smart about it, it doesn’t cost any more than a trip to Nordstrom and a tank of gas to Walnut Creek, Emeryville, or San Francisco. If we lose these small businesses, our neighborhood loses charm and functionality, and ultimately, the value of the beautiful homes and neighborhood we work so hard to maintain. Please join me in supporting our local retail vendors. More on this on ARL to follow. 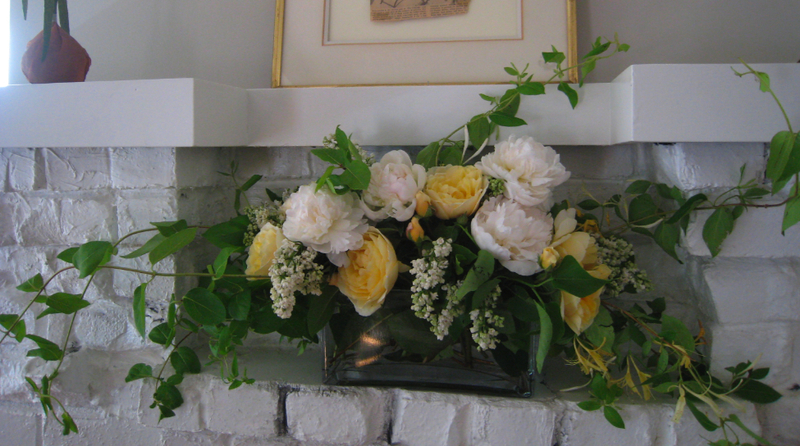 Garden roses, peonies, white lilac, honey suckle. 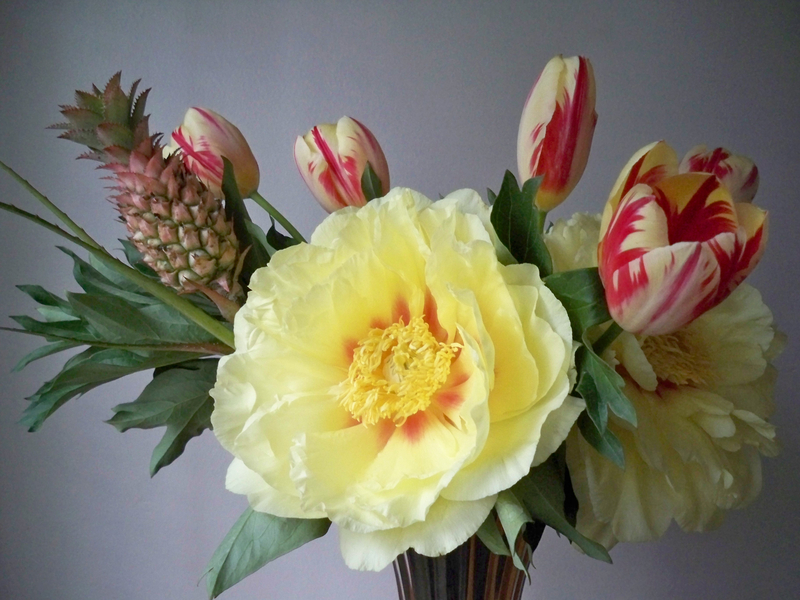 By Bloomies. Tomatoes vinaigrette, minus the oregano, recipe here. Xarmant Txakolina, my favorite white wine. Produced in the Basque country. I buy mine at Paul Marcus. It would be a great public service if everyone was granted a case each May. Honestly, it’s so amazing. Transportive. More information here. Eclectic and charming, as was the company. A good night in San Francisco. I might have to make a habit of it. But who wouldn’t love San Francisco when perched at the peak of Dolores Park in a courtyard-facing pied-à-terre? Welcome to the Best Coast DF! I responded to the day by going out and relieving Bloomies of some of their merchandise, lest it get damaged in the rain. 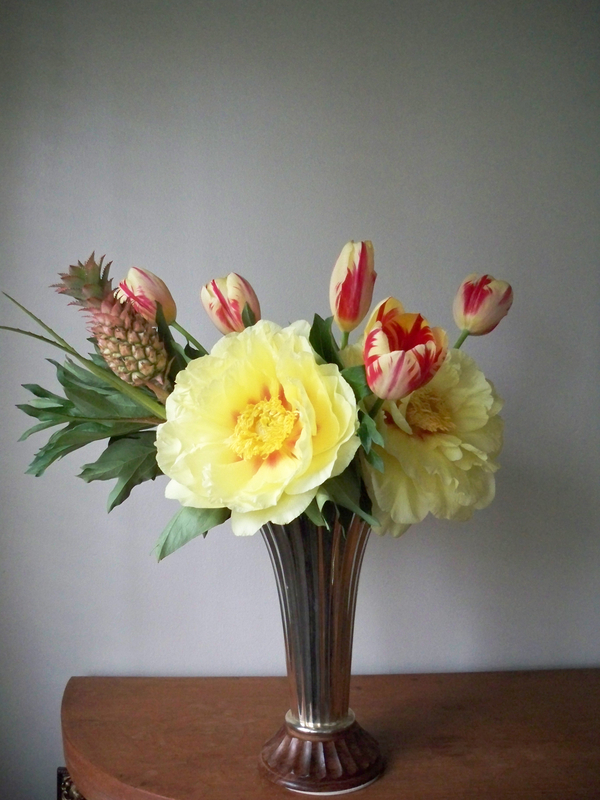 Nothing like big bright yellow peonies (and a fun mini pineapple) to lift the rain cloud from over your head!